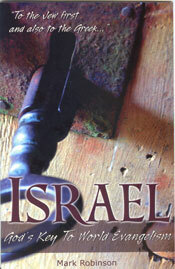 Through the centuries esteemed men of God with hearts for reaching the lost such as Robert Murray McCheyne, David Baron, John Wilkinson, James Gray, and Charles Spurgeon, have recognized the unique relationship between God, Israel, and world evangelism. What biblical understanding did these men have regarding God’s plan for reaching the lost? Take an in depth look into what the Bible has to say about God’s design for evangelizing the nations. The contents of this booklet should challenge and motivate all who desire to reach the world for Christ.